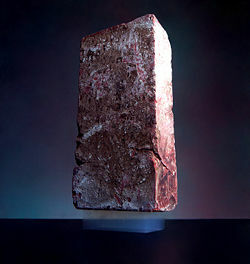 A 2.5 kg brick is supported by a piece of aerogel weighing only two grams. An aerogel is a low-density solid-state material derived from a gel in which the liquid component of the gel has been replaced with gas. The result is an extremely low-density, highly porous solid with several remarkable properties, most notably its effectiveness as an insulator. It is nicknamed frozen smoke due to its semi-transparent nature and the way light scatters in the material. It feels like expanded polystyrene (Styrofoam) to the touch. 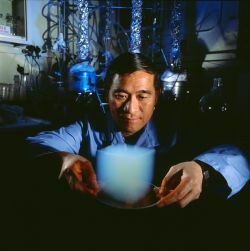 Peter Tsou of NASA's Jet Propulsion Laboratory holds a sample of an aerogel. Aerogels are useful for a variety of applications. Some are good for thermal insulation and for cleaning up chemical spills. Others, when appropriately prepared, offer a useful drug delivery system for medical treatments. Carbon aerogels are used in the manufacture of small electrochemical double-layer supercapacitors. 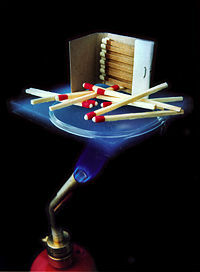 Some aerogels have been incorporated into tennis and squash racquets. In space exploration, aerogel materials have been used to trap space dust. By the addition of dopants, reinforcing structures, and hybridizing compounds to aerogels, the range of applications has been considerably broadened. The general method of producing an aerogel involves extracting the liquid component of a gel by a technique known as supercritical drying. In this technique, the liquid is brought to a "supercritical" state and then drawn out of the solid matrix of the gel. (When a substance is in its supercritical state, the distinction between its liquid and gas phases ceases to apply.) This method prevents the solid matrix from collapsing, as would happen with conventional evaporation. An aerogel was first created by Samuel Stephens Kistler in 1931, as a result of a bet with Charles Learned over who could replace the liquid inside a jam (jelly) jar with gas without causing shrinkage. Kistler produced the first aerogel from a colloidal form of silica gel. His later work involved the production of aerogels from alumina, chromium(III) oxide, and tin oxide. Carbon aerogels were first developed in the early 1990s. Silica aerogel can be made by drying (in an extreme environment) a hydrogel composed of colloidal silica, with water as the dispersion medium. Alternatively, the process may be started by mixing a liquid alcohol (like ethanol) with a silicon alkoxide precursor to form an "alcogel." Then the alcohol may be exchanged for liquid acetone (allowing for a better miscibility gradient), followed by liquid carbon dioxide, which is then brought above its critical point. A variant of this process involves the direct injection of supercritical carbon dioxide into the pressure vessel containing the aerogel. The end result removes all liquid from the gel and replaces it with gas, without allowing the gel structure to collapse or lose volume. Aerogel composites have been made using a variety of continuous and discontinuous reinforcements. The high aspect ratio of fibers such as fiberglass have been used to reinforce aerogel composites with significantly improved mechanical properties. Resorcinol-formaldehyde aerogel (RF aerogel) is a polymer chemically similar to a phenol formaldehyde resin. It is made in a way similar to the production of silica aerogel. Carbon aerogel is made by the pyrolysis of a resorcinol-formaldehyde aerogel in an inert gas atmosphere, leaving a matrix of carbon. It is commercially available as solid shapes, powders, or composite paper. Kistler gave the name aerogel because he derived it from silica gel. However, an aerogel is a dry material and does not resemble a gel in its physical properties. It is nicknamed frozen smoke, solid smoke, or blue smoke, due to its semi-transparent nature and the way light scatters in the material. To the touch, an aerogel feels like a light but rigid foam, something between Styrofoam and the green floral foam used for arranging flowers. Pressing softly on an aerogel typically does not leave a mark, but pressing more firmly leaves a permanent dimple. Pressing firmly enough will cause a catastrophic breakdown in the sparse structure, causing it to shatter like glass—a property known as friability. Although prone to shattering, an aerogel is very strong structurally. Its impressive load-bearing abilities are due to the dendritic microstructure, in which spherical particles of average size 2-5 nanometers (nm) are fused together into clusters. These clusters form a three-dimensional, highly porous structure of almost fractal chains, with pores smaller than 100 nm. The average size and density of the pores can be controlled during the manufacturing process. Aerogels are remarkable thermal insulators because they almost nullify three methods of heat transfer: convection, conduction, and radiation. They are good convective inhibitors because air cannot circulate throughout the lattice. Silica aerogel is an especially good conductive insulator because silica is a poor conductor of heat—a metallic aerogel, on the other hand, would be a less effective insulator. Carbon aerogel is a good radiative insulator because carbon absorbs the infrared radiation that transfers heat. The most insulative aerogel is silica aerogel with carbon added to it. Due to its hygroscopic nature, an aerogel feels dry and acts as a strong desiccant. People who handle aerogels for extended periods of time should wear gloves to prevent the appearance of dry brittle spots on their hands. Given that it is 99 percent air, an aerogel appears semi-transparent. Its color is due to Rayleigh scattering of the shorter wavelengths of visible light by the nano-sized dendritic structure. This causes it to appear bluish against dark backgrounds and whitish against bright backgrounds. Aerogels by themselves are hydrophilic, but chemical treatment can make them hydrophobic. If they absorb moisture, they usually suffer a structural change (such as contraction) and deteriorate, but degradation can be prevented by making them hydrophobic. Aerogels with hydrophobic interiors are less susceptible to degradation than aerogels with only an outer hydrophobic layer, even if a crack penetrates the surface. Hydrophobic treatment facilitates processing because it allows the use of a water jet cutter. 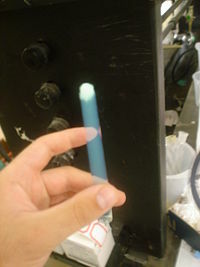 Aerogel produced at Florida State University by Elliot Schwartz and Robert Palmer. Silica aerogel is the most common type of aerogel and the most extensively studied and used. It is a silica-based substance, derived from silica gel. The world's lowest-density solid is a silica nanofoam at 1 mg/cm3 which is the evacuated version of the record-aerogel of 1.9 mg/cm3. The density of air is 1.2 mg/cm3. Silica aerogel strongly absorbs infrared radiation. It allows the construction of materials that let light into buildings but trap heat for solar heating. It has extremely low thermal conductivity (0.03 W·m/m2·K down to 0.004 W·m/m2·K), which gives it remarkable insulative properties. Its melting point is 1,473 K (1,200 °C or 2,192 °F). Carbon aerogels are composed of particles with sizes in the nanometer range, covalently bonded together. They have very high porosity (over 50 percent, with pore diameter under 100 nm) and surface areas ranging between 400–1000 m²/g. They are often manufactured as composite paper: non-woven paper made of carbon fibers, impregnated with resorcinol-formaldehyde aerogel, and pyrolyzed. Depending on the density, carbon aerogels may be electrically conductive, making composite aerogel paper useful for electrodes in capacitors or deionization electrodes. Due to their extremely high surface area, carbon aerogels are used to create supercapacitors, with values ranging up to thousands of farads based on a capacitance of 104 F/g and 77 F/cm³. Carbon aerogels are also extremely "black" in the infrared spectrum, reflecting only 0.3 percent of radiation between 250 nm and 14.3 µm, making them efficient for solar energy collectors. The term "aerogel" has been incorrectly used to describe airy masses of carbon nanotubes produced through certain chemical vapor deposition techniques—such materials can be spun into fibers with strength greater than kevlar and unique electrical properties. These materials are not aerogels, however, since they do not have a monolithic internal structure and do not have the regular pore structure characteristic of aerogels. Aerogels made with aluminium oxide are known as alumina aerogels. These aerogels are used as catalysts, especially when "metal-doped" with another metal. Nickel-alumina aerogel is the most common combination. Alumina aerogels are also examined by NASA for capturing of hypervelocity particles; a formulation doped with gadolinium and terbium could fluoresce at the particle impact site, with amount of fluorescence dependent on impact velocity. SEAgel is a material similar to organic aerogel, made of agar. Chalcogels, more correctly known as metal chalcogenide aerogels, are a group of aerogels made of a chalcogen (such as sulfur or selenium) combined with a metal (often platinum). Research is ongoing, and metals less expensive than platinum have also been used in creating chalcogels. Aerogels can be used for a variety of tasks, a number of which are noted below. Commercially, aerogels have been used in granular form to add insulation to skylights. After several trips on the Vomit Comet, one research team has shown that the production of silica aerogel in a weightless environment generates particles with a more uniform size and reduced Rayleigh scattering, so that the aerogel is less blue and more transparent. Transparent silica aerogel would be very suitable as a thermal insulation material for windows, significantly limiting thermal losses of buildings. The high surface area of various aerogels has led to many applications, including as chemical absorbents for cleaning up spills. This property also offers the potential for some aerogels to be used as catalysts or catalyst carriers. Some types of aerogel particles may be used as thickening agents in some paints and cosmetics. The performance of an aerogel may be augmented for a specific application by the addition of dopants, reinforcing structures, and hybridizing compounds. Using this approach, the breadth of applications for aerogels may be greatly increased. The commercial manufacture of aerogel 'blankets' began around the year 2000. An aerogel blanket is a composite of silica aerogel and fibrous reinforcement that turns the brittle aerogel into a durable, flexible material. The mechanical and thermal properties of the product may be varied based upon the choice of reinforcing fibers, the aerogel matrix, and opacification additives included in the composite. NASA has used certain aerogel materials to trap space dust particles aboard the Stardust spacecraft. The particles vaporize on impact with solids and pass through gases, but they can be trapped in aerogels. NASA has also used aerogels for thermal insulation of the Mars Rover and space suits. The low mass of aerogels is also advantageous for space missions. 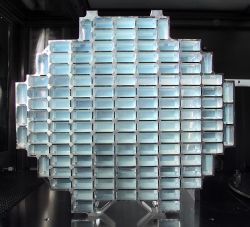 In particle physics, some aerogels are used as radiators in Cherenkov effect detectors. The ACC system of the Belle detector, used in the Belle Experiment at KEKB, is a recent example of such use. The suitability of aerogels is determined by their low index of refraction, filling the gap between gases and liquids, and their transparency and solid state, making them easier to use than cryogenic liquids or compressed gases. Resorcinol-formaldehyde aerogels are used mostly as precursors for the manufacture of carbon aerogels, or when an organic insulator with a large surface area is needed. Their surface area can be as high as 600 m² per gram of material. Metal-aerogel nanocomposites can be prepared by impregnating the hydrogel with a solution containing ions of a suitable noble metal or transition metal. The impregnated hydrogel is then irradiated with gamma rays, leading to precipitation of nanoparticles of the metal. Such composites can be used, for example, as catalysts, sensors, or electromagnetic shielding, as well as in waste disposal. A prospective use of platinum-on-carbon catalysts is in fuel cells. Some aerogels may be used as drug delivery systems, based on their biocompatibility. Due to the high surface area and porous structure of the aerogel, drugs can be adsorbed if introduced with supercritical carbon dioxide. The release rate of the drugs can be tailored based on the properties of aerogel. Carbon aerogels are used in the construction of small electrochemical double layer supercapacitors. Due to the high surface area of the aerogel, these capacitors can be 2,000 to 5,000 times smaller than similarly rated electrolytic capacitors. Aerogel supercapacitors can have a very low impedance compared to normal supercapacitors and can absorb/produce very high peak currents. Dunlop has incorporated aerogel technology into a series of its tennis racquets, having used it earlier in squash racquets. Chalcogels have shown promise in absorbing heavy metal pollutants such as mercury, lead, and cadmium from water. An aerogel material may be used to introduce disorder into the superfluid state of helium-three. ↑ S.S. Kistler. Coherent expanded aerogels and jellies. Nature 127 (3211) (1931):741. ↑ S.S. Kistler, "Coherent Expanded-Aerogels," Journal of Physical Chemistry 36(1): 52-64. ↑ R.W. Pekala, "Organic aerogels from the polycondensation of resorcinol with formaldehyde," Journal of Material Science 24(9) (1989): 3221-3227. ↑ Abul Taher, Scientists hail ‘frozen smoke’ as material that will change world, Times Online (August 19, 2007). Retrieved October 11, 2012. ↑ 5.0 5.1 Aerogels Terms, LLNL. Retrieved October 12, 2007. ↑ Lab's aerogel sets world record. LLNL Science & Technology Review. Retrieved October 12, 2007. ↑ David Biello, Heavy Metal Filter Made Largely from Air Scientific American (July 26, 2007). Retrieved October 12, 2007. ↑ Zero-Gravity Aerogel Formation. Retrieved October 25, 2007. ↑ Preventing heat escape through insulation called "aerogel". NASA CPL. Retrieved October 12, 2007. ↑ Down-to-Earth Uses for Space Materials. The Aerospace Corporation. Retrieved October 12, 2007. ↑ I. Smirnova, S. Suttiruengwong, and W. Arlt, "Feasibility study of hydrophilic and hydrophobic silica aerogels as drug delivery systems," Journal of Non-Crystalline Solids 350 (2004):54-60. ↑ Research group Pharmaceutical Thermodynamics. University Erlangen. Retrieved October 12, 2007. ↑ Marc Juzkow, Aerogel Capacitors Support Pulse, Hold-Up, and Main Power Applications, Power Electronics Technology (Feb. 1, 2002). Retrieved October 12, 2007. ↑ Dunlop Squash Racquets. pwp.com. Retrieved October 11, 2012. ↑ Mary Carmichael, First Prize for Weird: A bizarre substance, like 'frozen smoke,' may clean up rivers, run cell phones and power spaceships. Newsweek International. Retrieved October 12, 2007. ↑ W. P. Halperin and J. A. Sauls. Helium-Three in Aerogel. Retrieved October 12, 2007. Catching Comet Dust. NASA JPL. Retrieved October 12, 2007. Fricke, J., and A. Emmerling. Aerogels — Preparation, properties, applications. Structure & Bonding 77 (1992):37-87. Hüsing, N., and U. Schubert. Aerogels - Airy Materials: Chemistry, Structure, and Properties. Angewandte Chemie International Edition 37(12) (1998): 22-196. Pierre, A.C., and G.M. Pajonk. Chemistry of aerogels and their applications. Chemical Reviews 102(11) (2002): 4243-4266. All links retrieved February 13, 2016. Aerogel Research at LBL: From the Lab to the Marketplace. Aerogel FAQ at NASA JPL. American company researching and producing flexible aerogel blankets for insulation. This page was last modified on 3 February 2019, at 16:45.